Music video for Billy's live version of "Back In The U.S.S.R." I am not crazy about this music video but the concert DVD is very good. 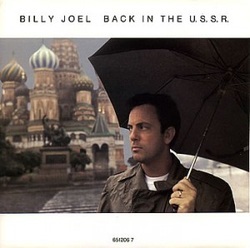 Download "Back In The U.S.S.R."
During his concerts in Russia in 1987, Billy performed The Beatles' "Back In The U.S.S.R." of course. The song was originally on The Beatles white album, and sounds like an ironic Beach Boys' song. After watching the Beatles' historic television appearance on the Ed Sullivan show in 1964, Billy decided that he would become a musician. The Beatles were unlike many other groups of the day, as they wrote their own music, sang their own songs, and played their own instruments. They inspired Billy to become a professional musician. Billy has covered other Beatles' songs in concert including "A Hard Day's Night," "I Saw Her Standing There," and "I'll Cry Instead." The video to the song is below. I am not crazy about this video as they spliced together images of Billy performing other songs, and make him appear to be somewhat spastic. But he does a great rendition of the song. 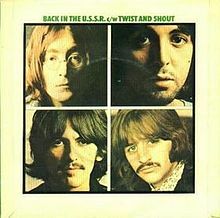 The Beatles' "Back In The U.S.S.R." single in the UK. Oh, flew in from Miami Beach B.O.A.C. Yeah I'm back in the U.S.S.R.
Yeah, back in the U.S.S.R.